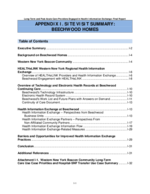 This report presents study findings from an environmental scan, literature review, key informants, and site visits, and was guided by frameworks to describe the state of HIE to support care coordination for persons receiving LTPAC/LTSS services and fill key information gaps. HIE includes both electronic and non-electronic exchange of health information. 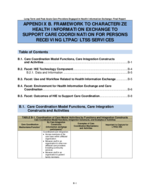 The study frameworks captured important use cases for and dimensions of HIE when used to support care coordination for LTPAC/LTSS. These frameworks can be applied to future studies and policy and standards activities to advance the use of HIE for LTPAC/LTSS. 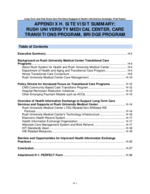 Drivers and facilitators of and barriers to the use of HIE to support care coordination for persons receiving LTPAC/LTSS are identified, along with opportunities to address these barriers and challenges, and accelerate the adoption of HIE, including interoperable HIE. 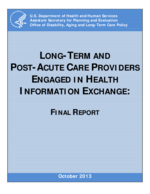 This study highlights the importance of information exchange in care coordination. While there are many models for care coordination, the care coordination model used was found to be less significant than a close working relationship between providers, care coordinators and patients and the exchange of timely, key information. 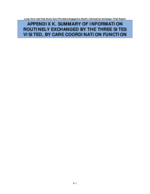 A key component of programs and interventions identified in this study to support care coordination is the communication of critical information, using electronic and other means. However, health information is siloed and often not shared, or shared in a timely manner across providers/caregivers or between health information systems. This lack of timely HIE results in poor continuity and coordination of care, safety and quality problems, redundancies in tests and other services, avoidable ED and hospital admissions, and associated avoidable costs. LTSS providers along with LTPAC providers are important partners in care coordination and transitions from hospitals. LTSS providers have important information that is generally not exchanged, such as functional and cognitive status, potential risks (e.g., fall history), elder abuse reports, use of services such as DME and homemakers, and information about the patient and family/caregivers that may be relevant to care. New delivery and payment models serve as drivers for LTSS to participate in HIE, particularly for HHAs, but barriers exist. There are few incentives for LTSS participation in HIE, low rates of EHR adoption, and disparate non-interoperable systems (e.g., client tracking, elder abuse reporting, and eligibility). Drivers of HIE are identified including new care delivery and payment models that recognize the importance of effective care coordination between providers, including LTPAC and LTSS providers. State and federal initiatives to support the adoption of HIT, EHRs, and electronic HIE are also described (e.g., standards, certification, programs to encourage adoption). Many of the drivers as well as barriers addressed in this study relate to the adoption of HIT such as EHRs, including CEHRT, to support electronic HIE. Adoption of electronic HIE by LTPAC/LTSS providers is growing but has been modest and much slower than other health care sectors. This is due in part to limited financial incentives for LTPAC/LTSS EHR adoption. Participation in HIEOs by LTPAC/LTSS providers is also modest, and driven largely by incentives from the HIEOs and other sources (e.g., providing connectivity, hardware, software, training, and tools). There is a lack of information about the value proposition of their participation in HIEOs. LTPAC/LTSS providers currently do not contribute much data to HIEOs. Interoperability standards are available or being developed that can accelerate HIE around care coordination, including transitions. However, there is little use of current standards by LTPAC providers or embedded in their HIT products. 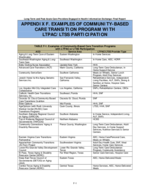 Further, there appears to be low awareness among LTPAC and other providers regarding the upcoming MU Stage 2 requirements and standards, or of the standards emerging through the S&I Framework and being balloted through HL7 to support the exchange of health information including on behalf of persons who receive LTPAC/LTSS services. In some cases there is awareness, but limited resources to support implementation of these available/emerging standards. 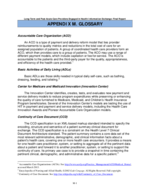 Further, when electronic HIE is available to LTPAC providers, use is reported to be modest due to the impact of HIE on workflow, including time involved to use electronic exchange applications; a lack of well-defined use cases for electronic HIE; usability issues related to the technology and display of data; perceived value of the information (e.g., timeliness, completeness, accuracy); the need to train and retrain LTPAC staff due to high turnover; limited resources to implement and support HIE, and privacy and security barriers. An in-depth analysis of the methods for HIE and types of data exchanged was undertaken to understand the state of HIE to support care coordination. HIE around care coordination, particularly transitions, was found to be complex and relies on multiple methods of HIE. 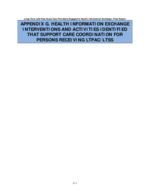 The methods of exchanging health information by LTPAC providers continue to be predominantly non-electronic (including telephone and fax) and at times electronic, but generally non-interoperable HIE (using secure e-mail with PDF attachments). Because of the complexity of care transitions, there will always be a need for face-to-face and telephone communication. Common data exchanged around care transitions and shared care functions are identified, as well as key data gaps, which can inform and help prioritize opportunities for expanding data available through electronic HIE, and associated standards. Data commonly exchanged during transitions and shared care were compared with data identified in the literature as important for transitions and coordination (e.g., CMS Roadmap to Better Care Transitions and Fewer Readmissions) and reported by study informants. Important data but not commonly exchanged include comprehensive care plans with patient goals and preferences, advance directives and power of attorney, a reconciled medication list, the patient's cognitive and functional status, planned interventions, followup appointment schedule with contact information, formal and informal caregiver status and contact information, designated community-based care provider, and social supports. Medication reconciliation during transitions of care is critical to care coordination and patient safety, and is one of the most highly rated functions of HIE, but significant challenges exist related to the exchange of this information. Determining the pre-hospital medications and reconciling with post-hospital medications to determine ongoing medication orders is challenging. HIE between LTPAC providers and pharmacies is usually inefficient. Exacerbating the problem is physicians' lack of historic knowledge of the patient and the overall POC, and lack of complete and accurate medication history information. Access to medication information remains a challenge even when a HIEO is available. New processes are emerging to improve timely exchange of information, including secure access to hospital and LTPAC providers' EHRs, shared network drives to house hospital information, proprietary electronic referral applications for subscribers to exchange information, and access to HIEOs. These new processes are generally not advancing interoperable HIE. Providing additional incentives to support LTPAC/LTSS use of electronic HIE; without incentives participation by LTPAC/LTSS will likely remain low. 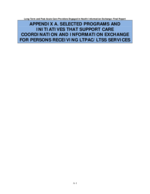 Increasing LTPAC/LTSS provider awareness and use of interoperability standards. Better communicating the emerging value proposition and benefits of electronic HIE to LTPAC/LTSS providers. Identifying additional, well-defined use cases relevant to LTPAC/LTSS. Better defining and validating measures that reflect HIE, electronic and other means, on care coordination. LTSS providers' data, data needs, systems, and potential for HIE, and educate HIEOs and other stakeholders about the value of LTSS participation in HIE. How HIE is and can be used to engage patients/consumers and their families and caregivers in the coordination of their care (e.g., patient portals and other means). 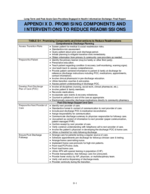 In summary, advancing HIE to support care coordination for persons receiving LTPAC/LTSS will require a multifaceted approach, including leveraging opportunities in the policy and health service delivery environments; providing financial incentives to accelerate HIE; improving enabling technology such as EHRs and interoperability standards; identifying key HIE use cases and modifying workflows to support electronic HIE; improving measures to monitor the impact of HIE on care coordination processes and outcomes; and widely communicating the value proposition of HIE with and for LTPAC/LTSS providers and patients. 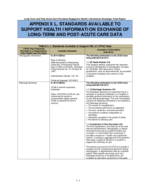 This study identifies several opportunities and areas of further study to guide future efforts to address challenges and barriers, and provide more incentives for the use of HIE to support care coordination for persons receiving LTPAC/LTSS.